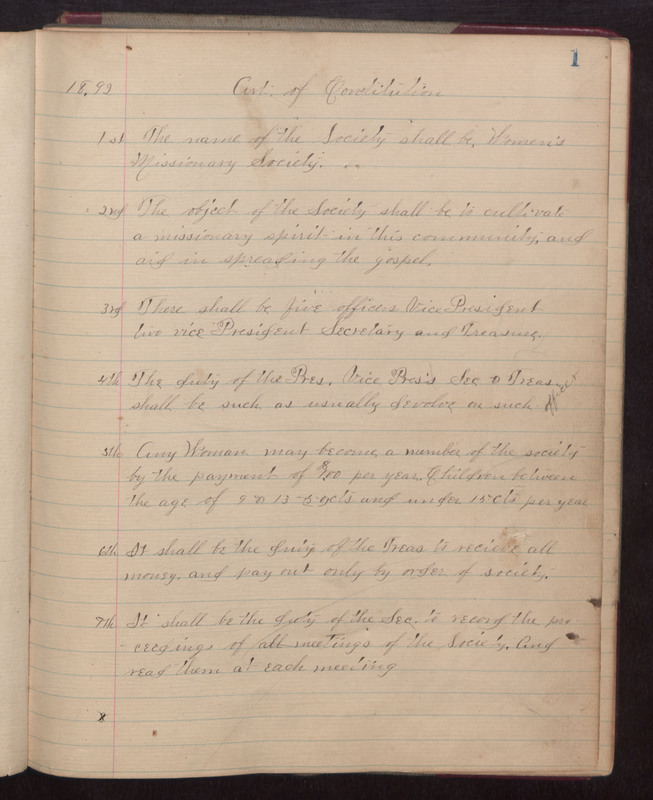 1892 Cert of Constitution 1st The name of the Society shall be Women's Missionary Society. 2nd The object of the Society shall be to cultivate a missionary spirit in this community and aid in spreading the gospel. 3rd there shall be five officers Vice President two vice president secretary and treasurer. 4th The dury of the Pres. Vice Pres's Sec & Treas. shall be such as usually devolve on such officer. 5th Any woman may become a member of the society by the payment of $100 per year. Children between the ages of 9 and 13 [?] and under 15 cts per year. 6th It shall be the duty of the Treas to receive all money and pay out only by order of society. 7th It shall be the duty of the Sec. to record the preceedings of all meetings of the Society. And read them at each meeting.